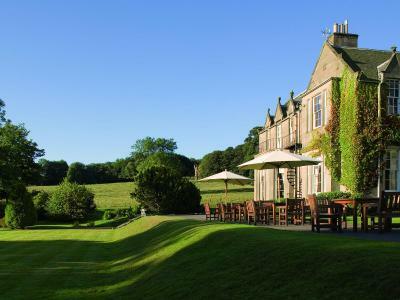 Lock in a great price for Norton House Hotel & Spa – rated 8.8 by recent guests! Had a great stay but swimming times for children are not good - there should’ve an hour say 11am-12 noon where guests children can swim Monday to Friday No access to the pool till 3pm is not sufficient if you are on a break with your kids. Spa on premises, close to airport, decent restaurant.. Indeed, bed was a bit like a cloud. Our stay was very short as we were departing from Edinburgh Airport. The hotel's close proximity to the airport was one reason we selected it and we were not at all disappointed in that regard. Nice that for a hotel close to a major transportation hub this spot is very secluded. The staff was very helpful and the food quite good. Especially high satisfaction with the friendly and accommodating staff. Right at the airport, but seems rural because it's on a large piece of beautiful farm land! The lounge areas off the bar were beautifully appointed Great toiletries on the room. Great facilities, lovely comfortable and clean room. Spa was excellent. It was very accessible, had friendly staff and the breakfast was fab. Beautiful setting, quiet location, even though convenient for airport I didn’t hear any aircraft. 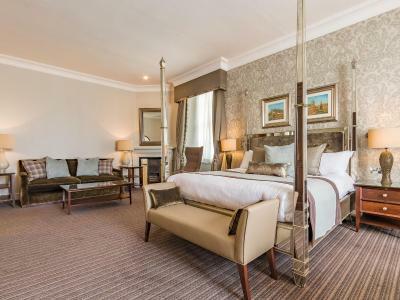 Norton House Hotel & Spa This rating is a reflection of how the property compares to the industry standard when it comes to price, facilities and services available. It's based on a self-evaluation by the property. Use this rating to help choose your stay! 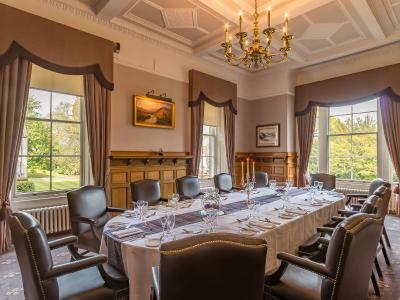 Set in a Victorian mansion in 55 acres of grounds, Norton House features a luxury spa, award-winning restaurant and boutique rooms with free internet. Edinburgh is a 20-minute drive, and Edinburgh Airport is 3 miles away. 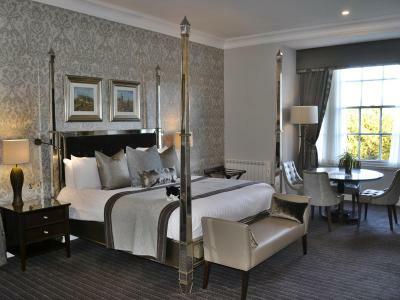 The 4-star bedrooms at Norton House Hotel & Spa each have a modern bathroom with free toiletries and fluffy bathrobes. All rooms have a satellite TV/DVD player and a mini-bar. Guests can relax in the sauna, steam room or hydrotherapy pool in the luxurious spa. The health club also has a swimming pool with feature fountains, a fully equipped gym and treatment rooms. 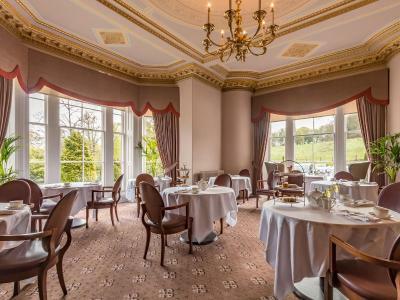 The Brasserie offers traditional British cuisine, and The Glass Lounge serves classic cocktails and afternoon teas. 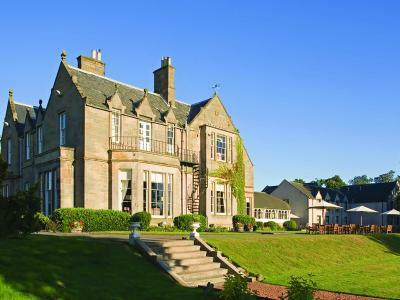 Set in leafy grounds, Norton House Hotel is just off the junction of M8 and M9 motorways. 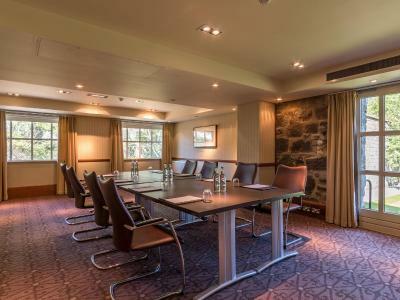 Free on-site parking is available, and Edinburgh Castle can be reached in 20 minutes by car. This property also has one of the top-rated locations in Newbridge! Guests are happier about it compared to other properties in the area. This property is also rated for the best value in Newbridge! Guests are getting more for their money when compared to other properties in this city. When would you like to stay at Norton House Hotel & Spa? These rooms offer additional living space, rain showers, built-in bathroom Tilevision TVs and a seating area. Classic bedrooms offer a wide range of amenities including the finest cotton sheets, a selection of pillows in every room, flat-screen TVs and free Wi-Fi internet access. House Rules Norton House Hotel & Spa takes special requests – add in the next step! Norton House Hotel &amp; Spa accepts these cards and reserves the right to temporarily hold an amount prior to arrival. Norton House Hotel & Spa accepts these cards and reserves the right to temporarily hold an amount prior to arrival. Please note that the sauna, steam room, swimming pool and hydrotherapy pool are closed from 3 until 17 January due to refurbishment. The gym, fitness facilities and spa will be open during this time. Guests are advised to book restaurant tables and spa treatments in advance, to avoid disappointment. When booking more than 5 rooms, different policies and/or supplements may apply. The hotel will contact guests regarding this. Staff at breakfast publicly humiliated one of the waitresses who had made a mistake by telling her off within ear shot of guests. Very awkward and uncomfortable to experience. I didn't like that you had to go to another site for the pool, spa area. Felt the drink prices were quite over priced but apart from that the whole experience was great! Had a great chilled night away with my girlfriend. Was exactly what I thought it was gonna be! Top of curtains in room are ripped. Really un-appealing & grim. Room wasnt worth the money!!! Freezing cold in room from when we arrived for our stay until we left and couldnt even wear bath robes as Bath robes -one smelled of a old lady's perfume, another had orange food spilled down it (really disgusting & upsetting as wanted to wear these to chill out and to also wear going into pool room etc. On initial online booking it showed me a completely different room offered to us and the room we received was dull & Very small. The fact you guys dont have a road name is crazy. Such a inconvenience to travel just from Glasgow to. Should maybe think of better signs and place them some where people can identify the hotel. Limited options at restaraunt. Off putting. Things in room were also rather dusty. Whish we had got the room we were looking at but ended up no rooms left and as stated before was shown a lovely room on booking.com on your hotel and that isn't what we received. Bed was great! So comfy. Loved the little cat touch for the door. Buffet breakfast included in stay was fabulous loved it! Although slightly greasy. Loved the pool,jaccuzi,sauna & steam room was fab. Didnt get a chance to enter spa as limited time but looked great passing. The wine was very expensive either by glass or bottle. It was good quality but a little on the pricey side. The breakfast was plentiful and catered well for my gluten free needs. There was a substantial varied selection. The staff were friendly and accommodating. Our evening meal was delicious and we were able to choose plenty with our half board allocation of £35 per person. The buffet breakfast was fantastic and the cleanliness of the whole hotel and facilities was great! Reception staff were extremely helpful and pleasant. I liked everything- very nice ! Lovely room, very spacious and nicely decorated. Very clean, helpful staff and great tasting food. The food was on the pricey side and the Ceasar salad and cheese plate were both a bit of a disappointment. A 250ml glass of wine is a hefty £14,25 per glass. Loved the location. Very rural but still only 6 minutes out of Edinburgh by Uber. Lovely hotel and wish I'd had more time to enjoy the facilities, especially the health club. Small room size, mattress soft and uncomfortable, pillows cheap and unsupportive. Insufficient staff on hand at peak meal times. Well kept grounds, food good, blend of modern and original features. Staff pleasant and helpful.